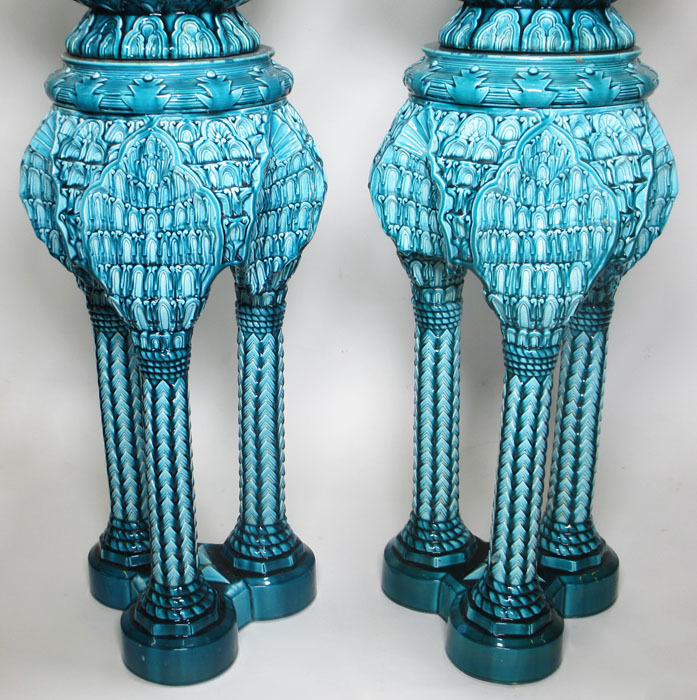 A Fine Pair of French 19th Century Moorish Style - Turquoise Glazed Pottery Jardinieres (Planters) on stands by Clément Massier (French, 1845–1917) Golfe-Juan (After 1884). The globular bowl with three upright scalloped pistol handles, molded all over with intricately entwined lattice and scalloped knot-work, the similarly molded circular pedestal formed by three columns topped by stylized shells, on a Trefoil base. Circa: Paris, 1890. Clément Massier's family has been producing ceramics and pottery pieces since the early 18th century. Pierre Massier (1707-1748), Clément Massier's great grandfather, opened his first factory in Vallauris near Golfe-Juan in the South of France. The factory mainly produced bricks, garden and decorative items and cookware, however with the help of his grandson Jacques (1806-1871) and his sons Clément and Delphin (1836-1907) as well as the Italian master ceramic artist Gaetano Gandolfi, who joined the firm in 1859, the firm grew to become renown for their high quality and exotic works. 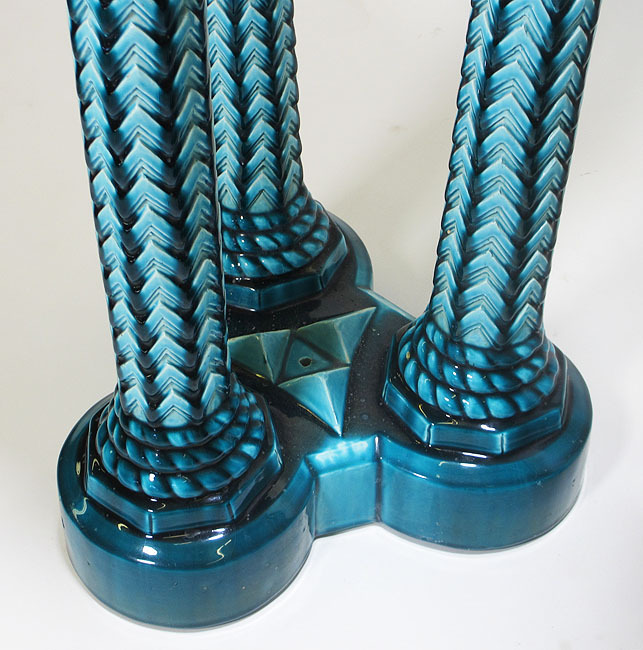 By 1884, now in Golfe-Juan and under the leadership of Clément, the firm began producing Moresque-influenced pottery. These new designs became very successful for business and the demand for their wares grew to clients from around clients around the world. 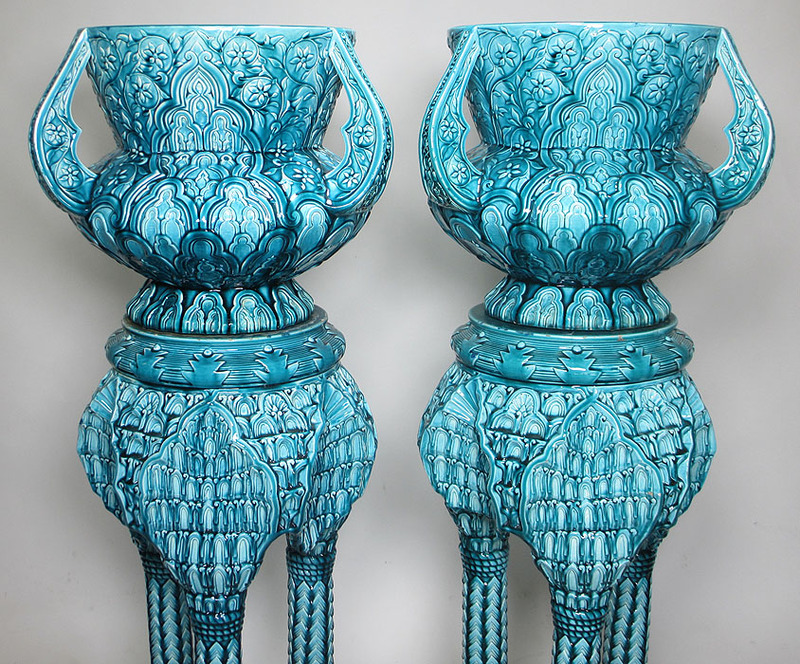 A Fine Pair of French 19th Century Moorish Style - Turquoise Glazed Pottery Jardinieres (Planters) on stands by Clément Massier (French, 1845–1917) Golfe-Juan (After 1884). 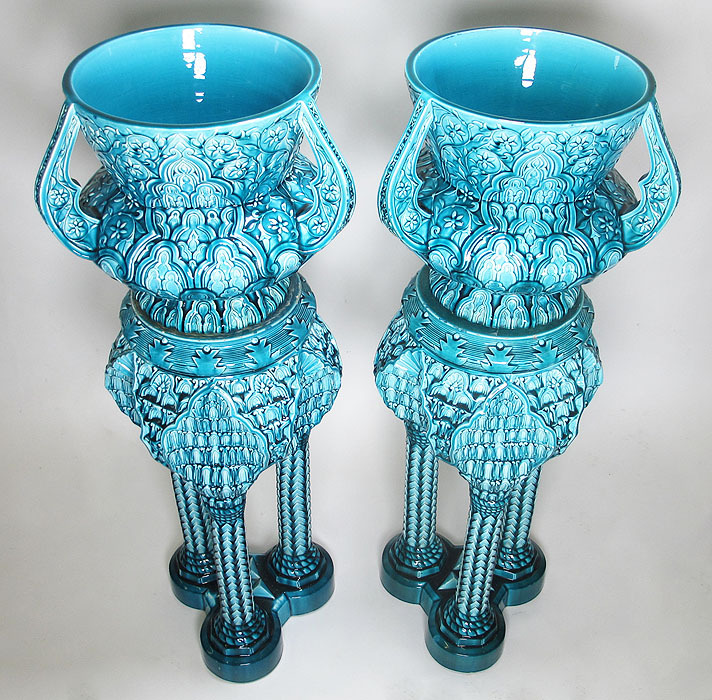 The globular bowl with three upright scalloped pistol handles, molded all over with intricately entwined lattice and scalloped knot-work, the similarly molded circular pedestal formed by three columns topped by stylized shells, on a trefoil base. Circa: Paris, 1890. Clément Massier's family has been producing ceramics and pottery pieces since the early 18th century. Pierre Massier (1707-1748), Clément Massier's great grandfather, opened his first factory in Vallauris near Golfe-Juan in the South of France. The factory mainly produced bricks, garden and decorative items and cookware, however with the help of his grandson Jacques (1806-1871) and his sons Clément and Delphin (1836-1907) as well as the Italian master ceramic artist Gaetano Gandolfi, who joined the firm in 1859, the firm grew to become renown for their high quality and exotic works. 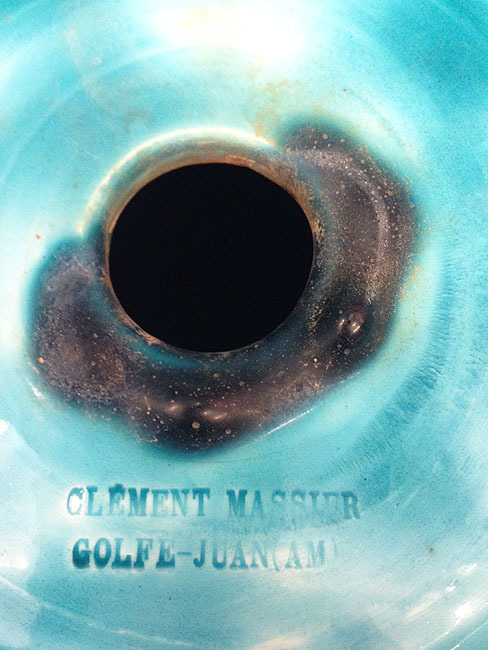 By 1884, now in Golfe-Juan and under the leadership of Clément, the firm began producing Moresque-influenced pottery. 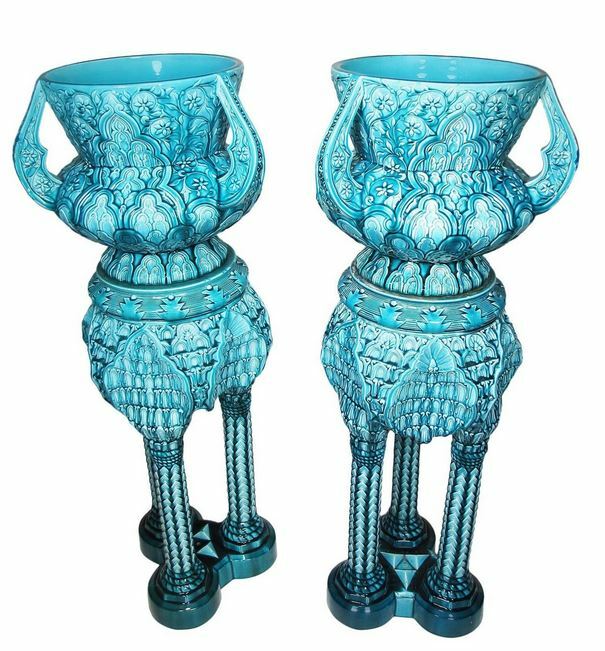 These new designs became very successful for business and the demand for their wares grew to clients from around clients around the world.